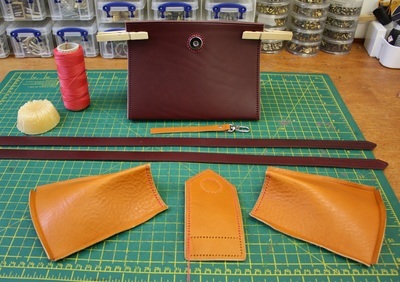 As usual, all the bag's constituent parts have been cut by hand. 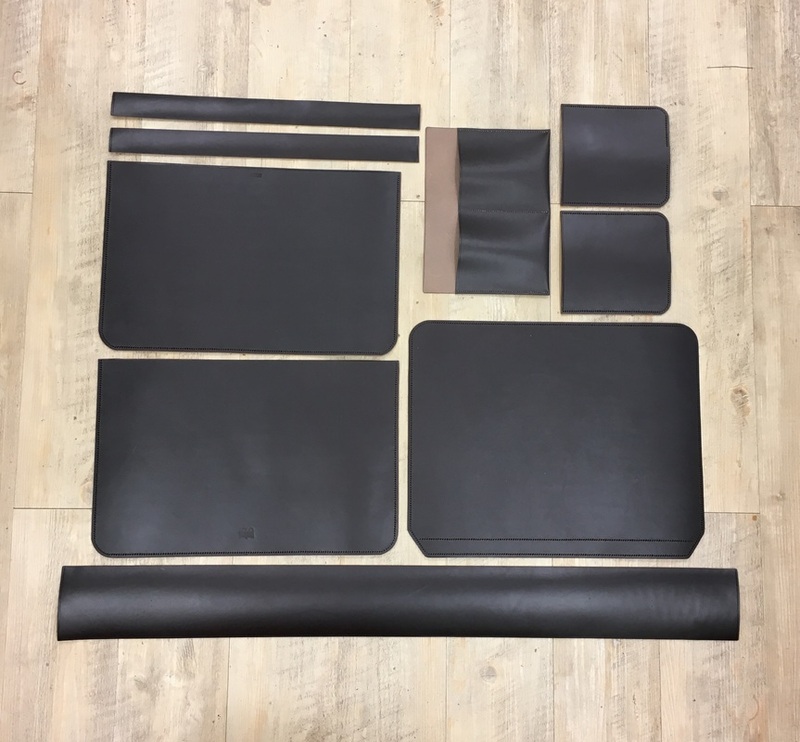 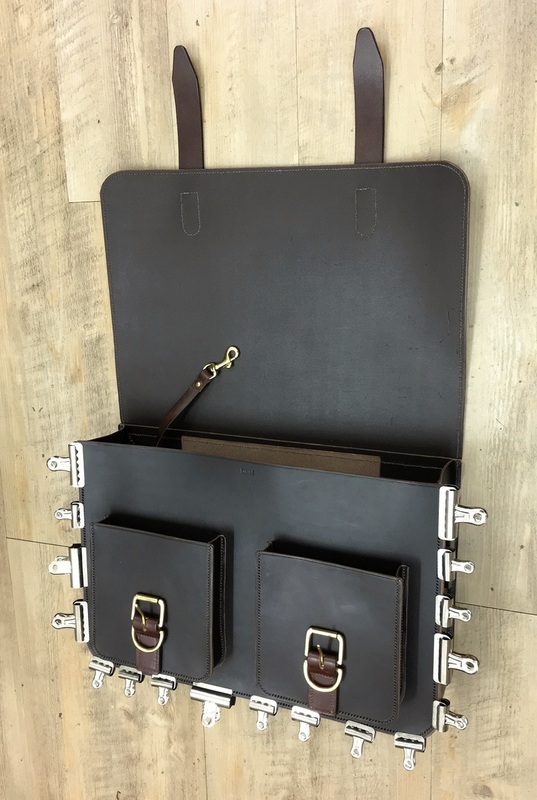 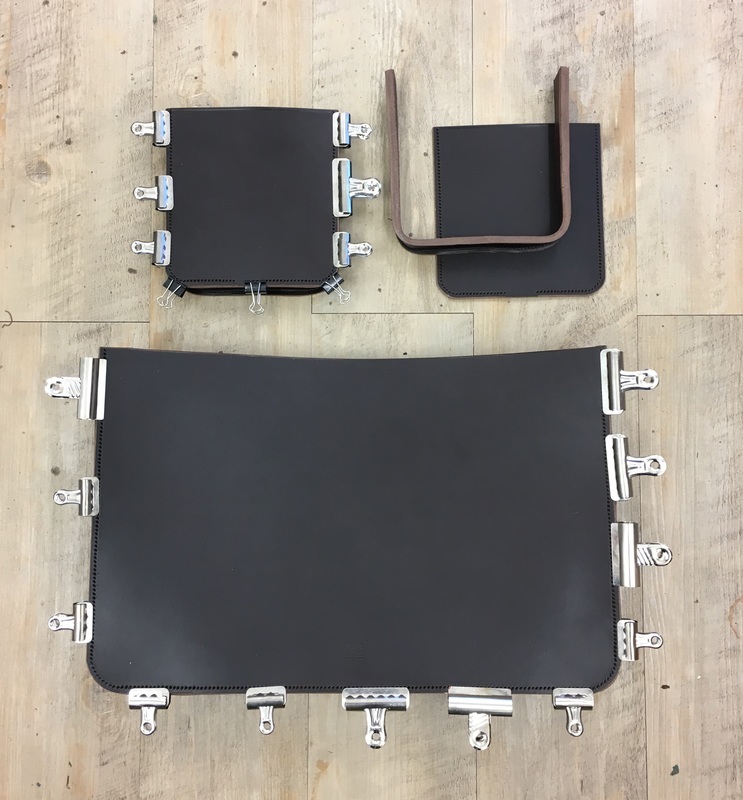 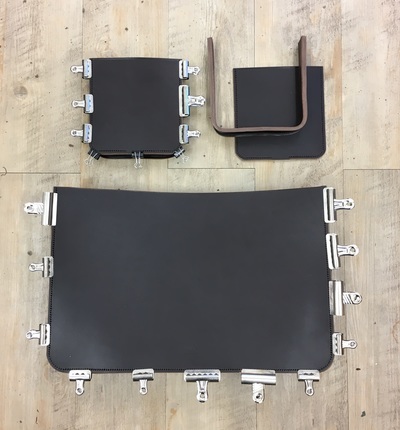 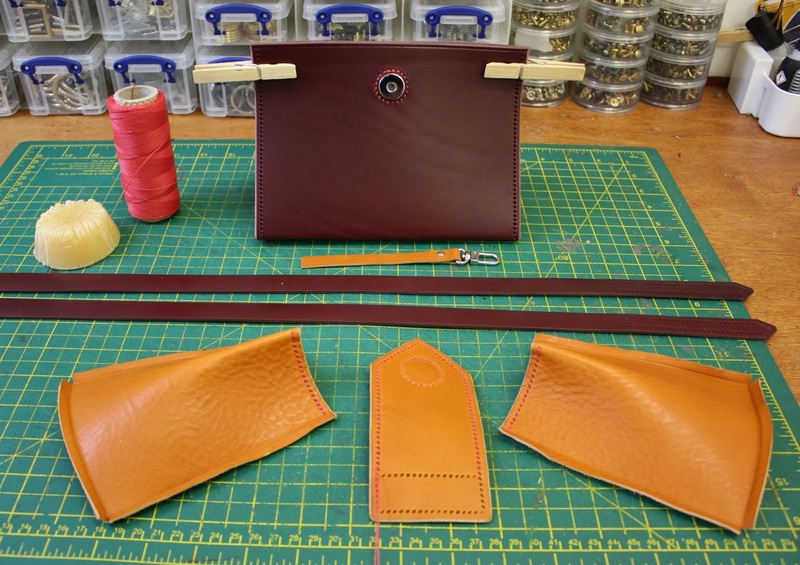 Using the equipment shown, the pieces will all need to be edge-finished and stitching holes punched before any bag assembly can be undertaken. 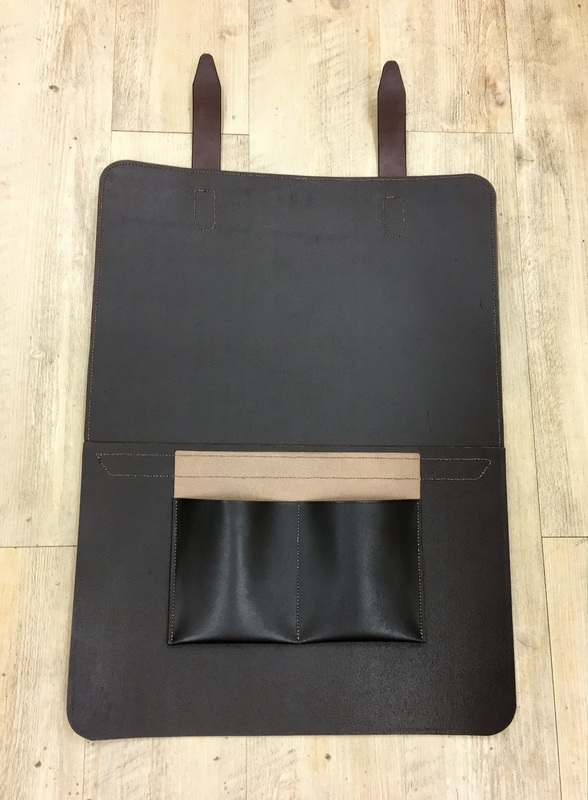 The supporting base of the main body of the bag has been stitched in place as has the bottom of the full-width inside back pocket. 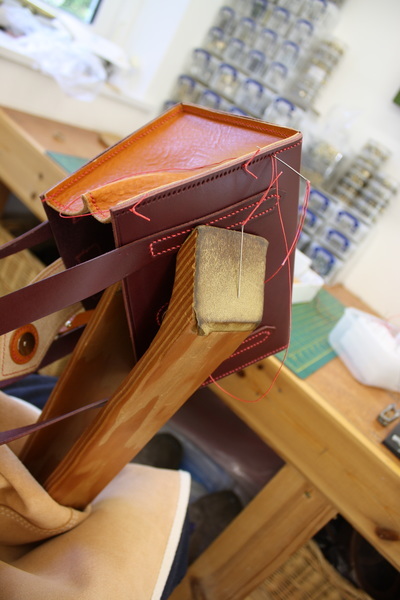 The edges of the side panels have been wet-moulded in preparation for stitching and their top edges have been saddle-stitched. 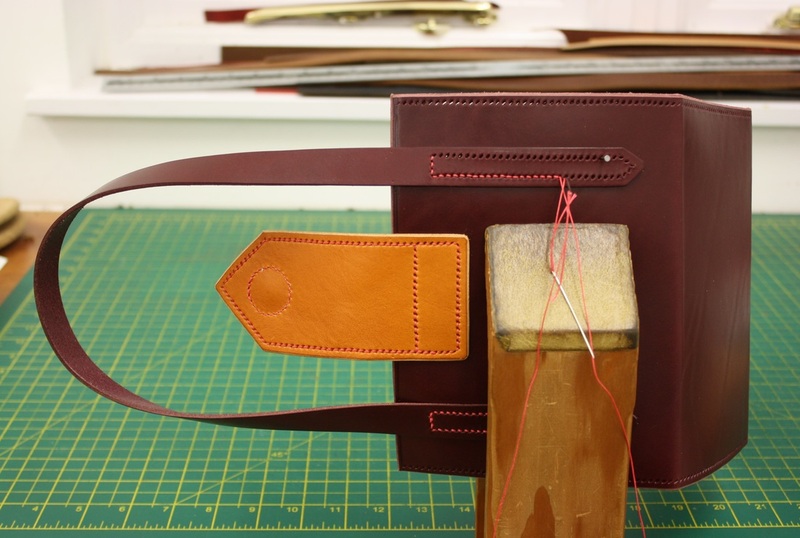 The horse bit serves as a decorative attachment for the front handles and the stitch holes on the leather attachments have been punched. 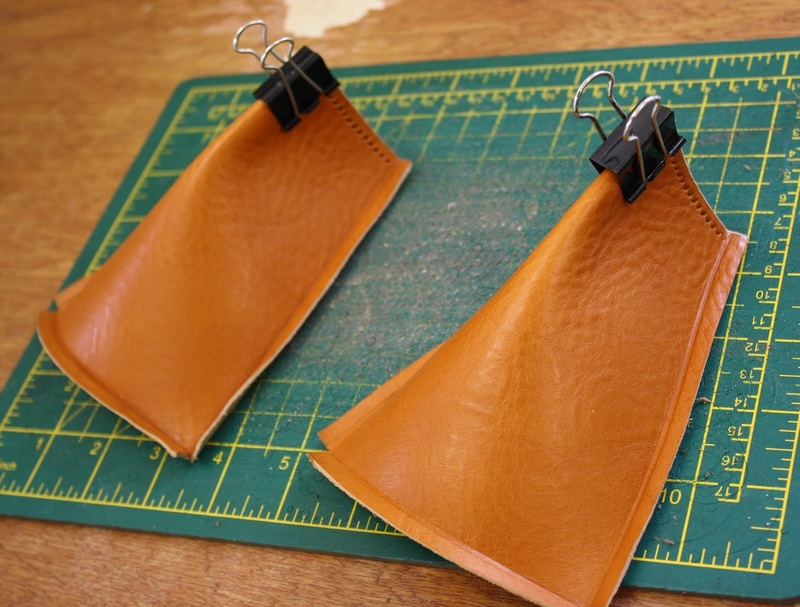 The inside top flap closures have been edge-stitched and two pairs of magnets have been stitched in place. ​The key fob is now ready for insertion. 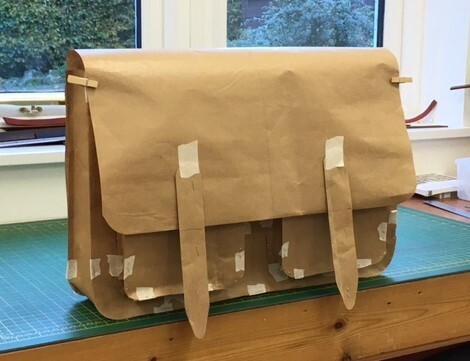 The making of a commissioned piece: a Large Messenger Bag. 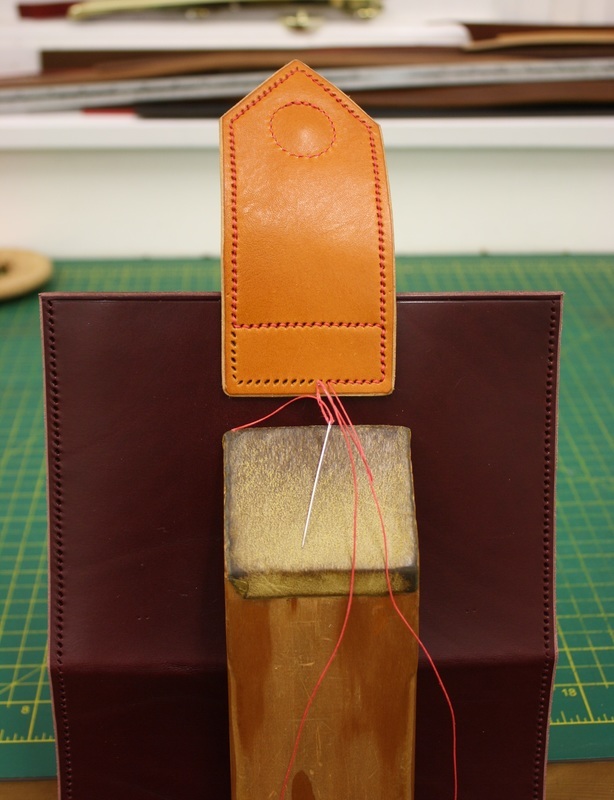 ​An initial paper model gives an idea of the bag’s final proportions. From this, pattern pieces are constructed which are used to cut the multiple pieces of the bag. ​Stitching holes are punched and buckles and D-rings attached to the straps and all edges are bevelled and polished. 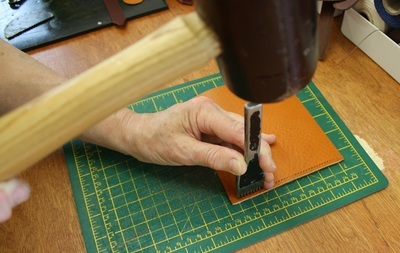 The leather is wet moulded into shape to create bag and pocket gussets and glued and clamped into position before being stitched in place. ​Holding the work in a wooden clam, the bag flap is edge-stitched then sewn to the back body panel, simultaneously attaching an inside pocket into the stitch lines on the reverse side. 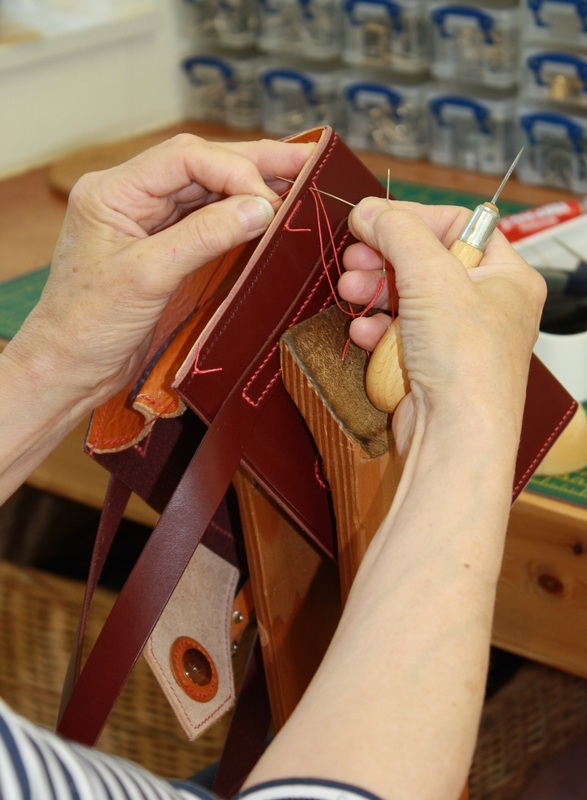 All buckles, straps and hardware have to be stitched in place whilst the bag is flat and open. 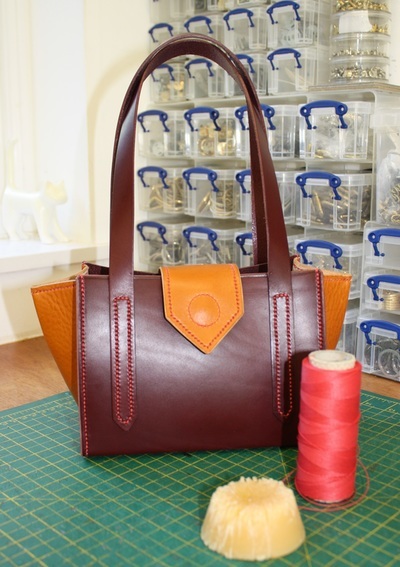 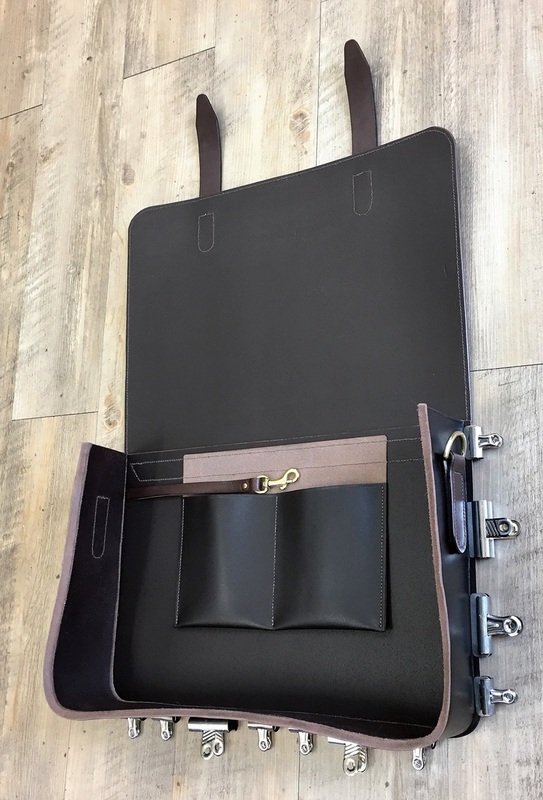 ​The bag is assembled by gluing, clamping then stitching the gusset to the back section, then later stitching the front panel complete with pockets, to the front of the gusset piece. 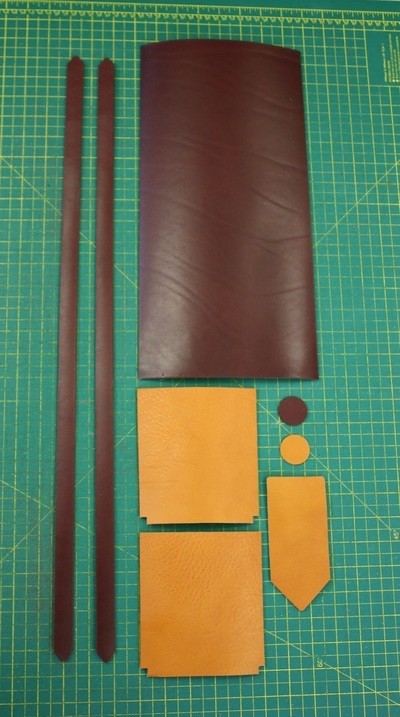 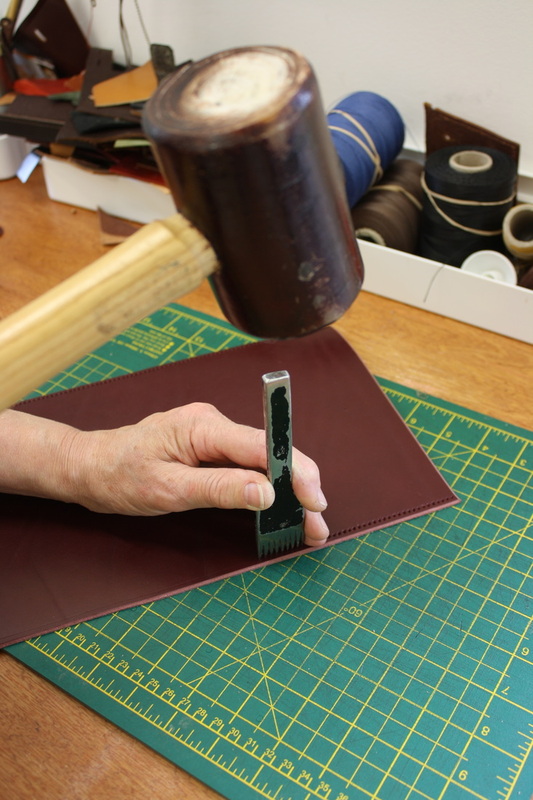 The individual bag sections are cut by hand from shoulder hide using patterns. ​Stitch holes are punched and the positions of handles and closures are marked. 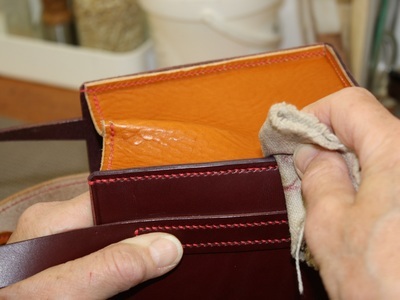 Edges are finished by applying a glue solution then polished or burnished until smooth. 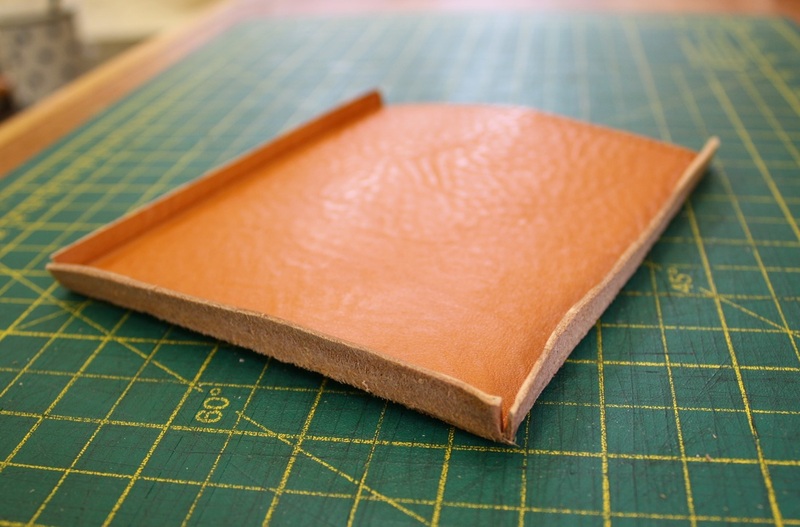 ​Panels that are to be moulded have their edges skived (scraped thinner) and a deep groove created on the reverse side, to allow the dampened edge to be folded up into shape. 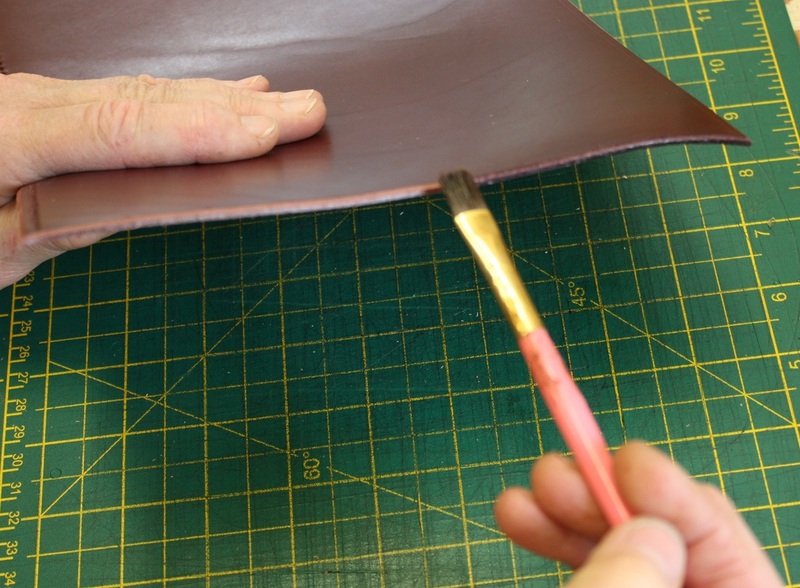 ​Deep full-width grooves mark the final crease lines for the base which will be dampened then folded into position. Individual pieces are edge-stitched by saddle-stitching using lengths of waxed linen thread with a harness needle fixed at either end. 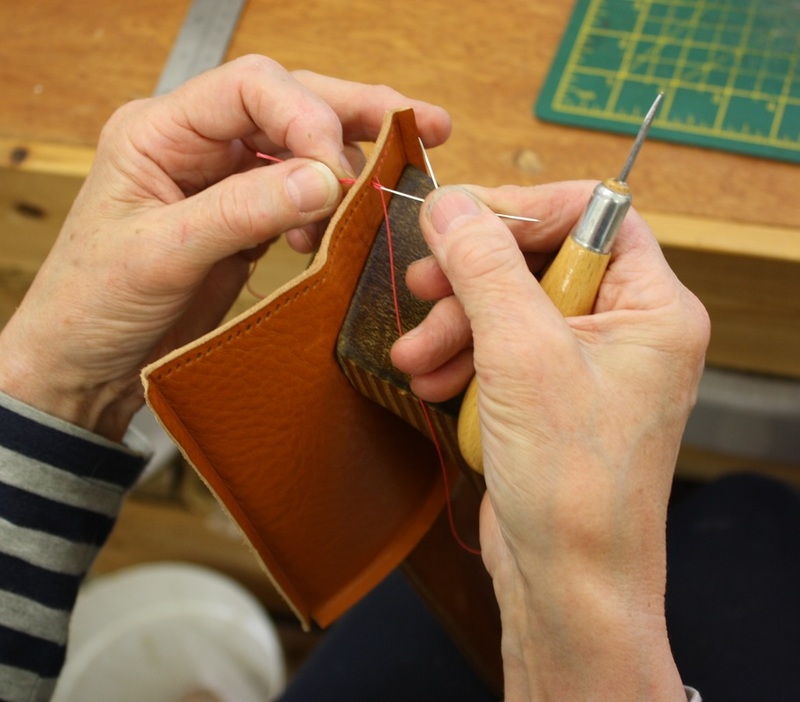 The work is held in position in a clam whilst each needle is inserted in turn into the stitch holes and the thread is pulled through tightly to create a series of locking stitches. 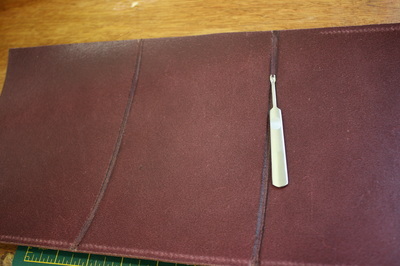 Folds in the side panels are held in place by over-stitching. 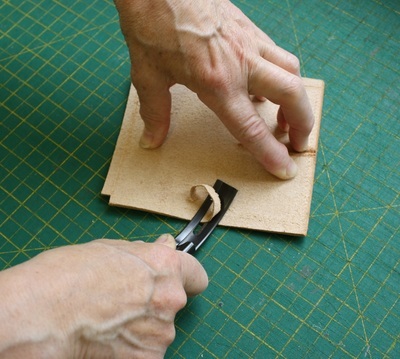 ​Magnetic closures are glued then stitched in place onto the bag's body and tab. 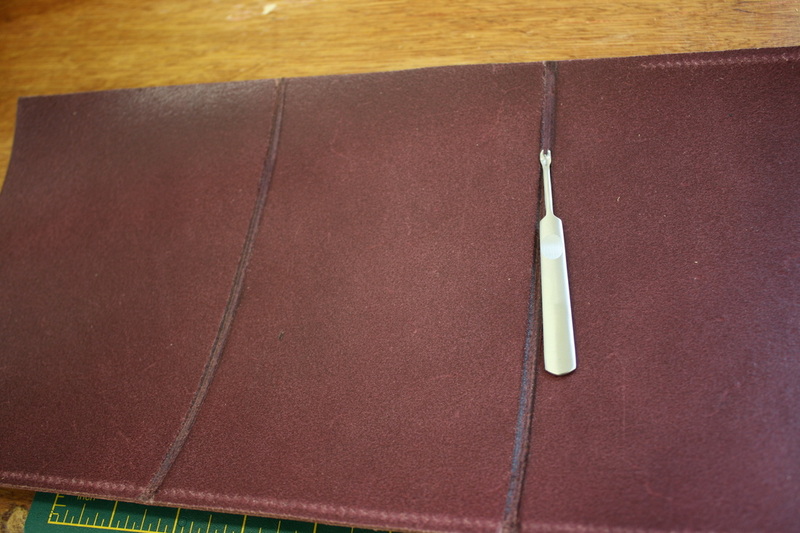 The tab and handles are then stitched on to the body. The bag is assembled and the side panels are glued and held in position using clamps then retaining tacks or stitches. Again the bag is held in position in a clam to enable saddle-stitching to be undertaken as before. The stitch holes are carried through into the side panel edges by piercing through the line of holes punched down the side of the bag using an awl and the two edges are saddle-stitched together. The rough edges are rounded off using an edge beveller and again are finished by burnishing. 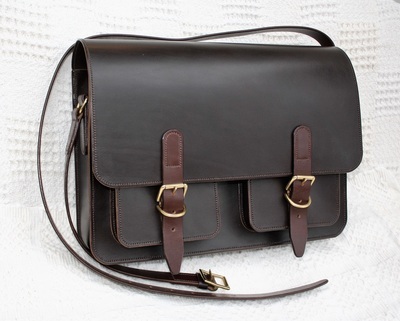 The completed bag is waxed and polished . 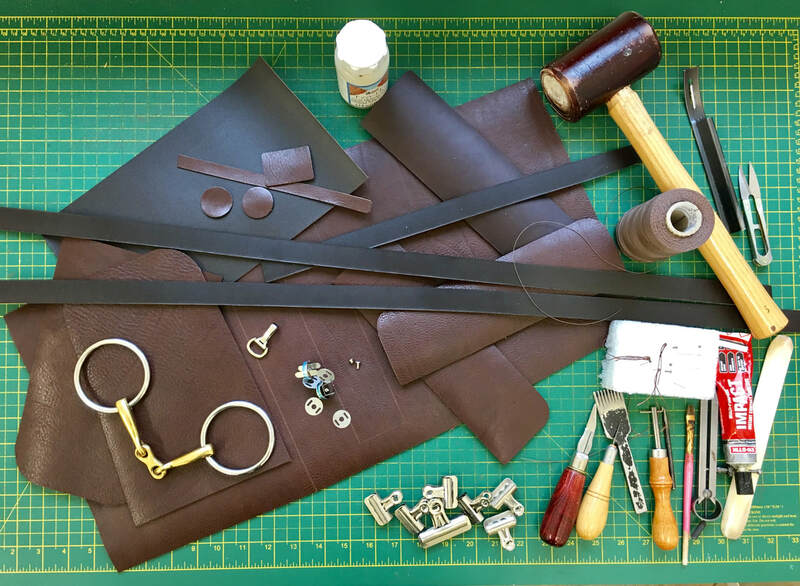 Come and visit my Workshop! 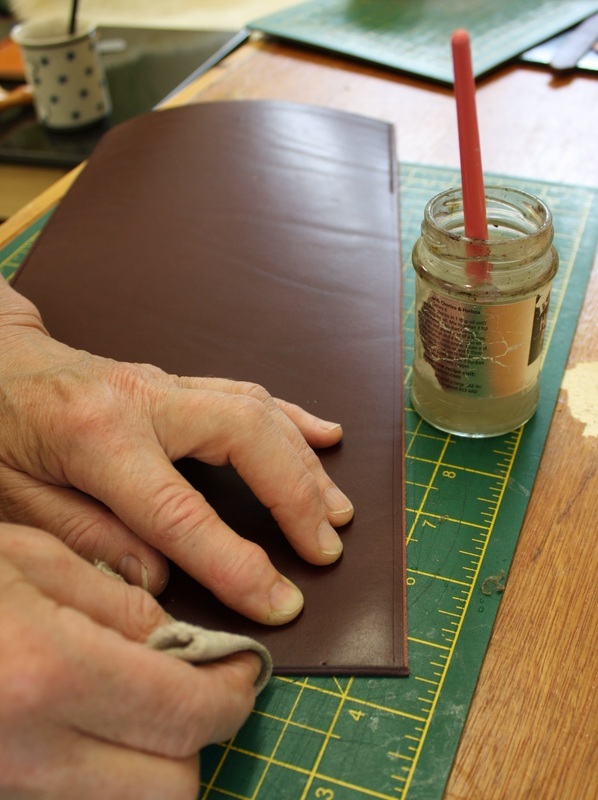 Preparations for NEOS (North East Open Studios) are gathering speed. For anyone not familiar with this excellent and very enjoyable 10-day event (and I am one of the hosts! 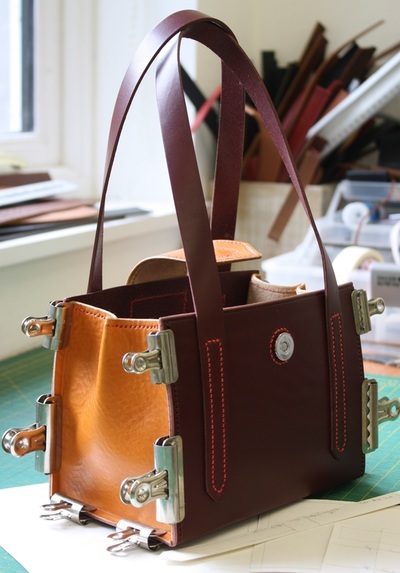 ), NEOS is the largest open studios event in Scotland, when over 200 artists/crafters open their studio doors to the public during September. 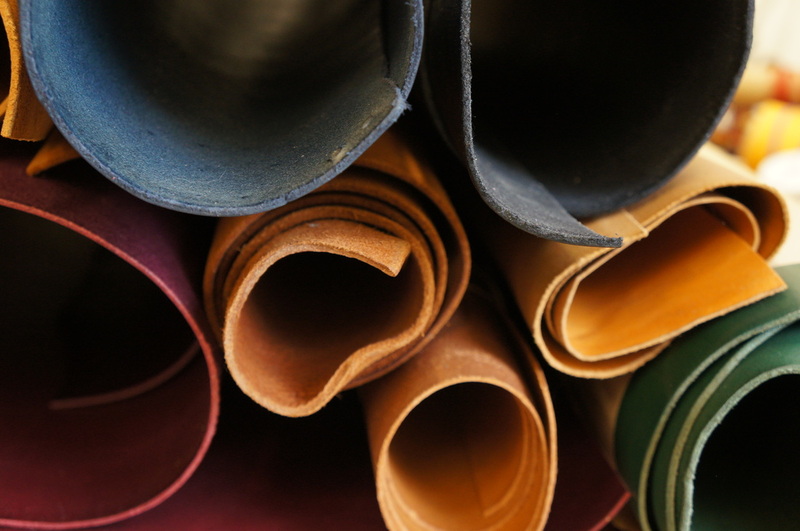 NEOS is supported by an excellent and informative website as well as a free colour directory that contains details, directions and maps of all participating artists, which allows you to plan a day out. The directories have been distributed to shops, galleries and public places in the North East. This year, I am part of the ‘Banchory Cluster’ of artists who have contributed a piece of our work for a NEOS display at the Whigmaleerie Gallery in Banchory (on the main road near the traffic lights). 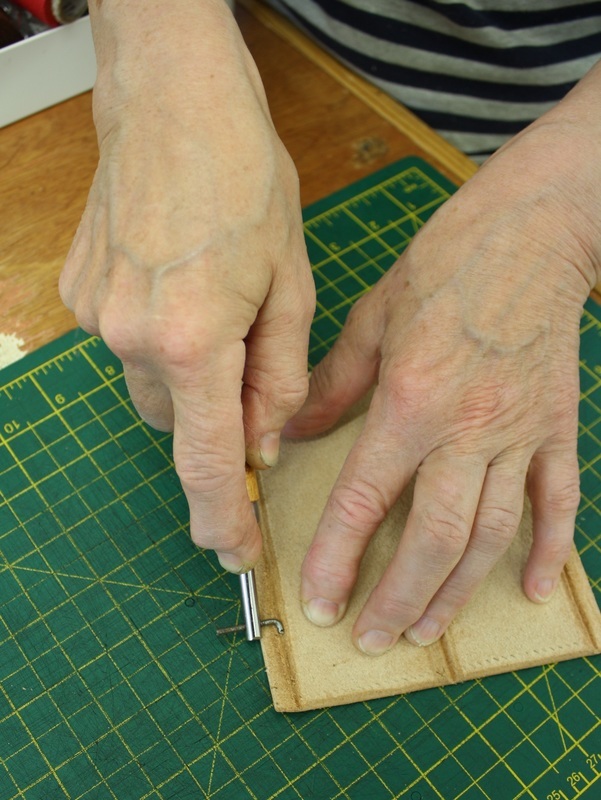 Our ‘Cluster’ map, kindly created by Kath Duguid at Whigmaleerie, can be seen on the NEOS website and at the Gallery, along with our own cards and leaflets. Should you visit my workshop, you will immediately be hit by the wonderful smell of leather. After the excitement settles down, I then show visitors the shoulders of vegetable tanned hide and the techniques I use to work the leather…cutting by hand, bevelling then polishing edges and saddle-stitching the leather pieces together using waxed linen thread. 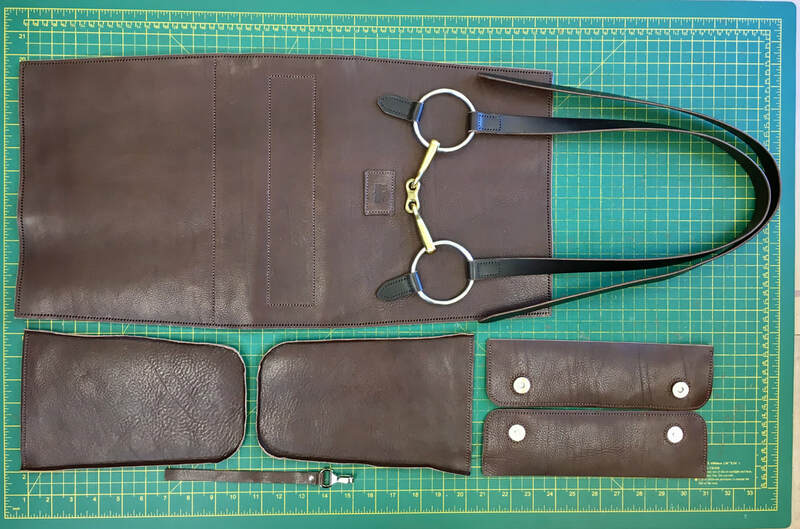 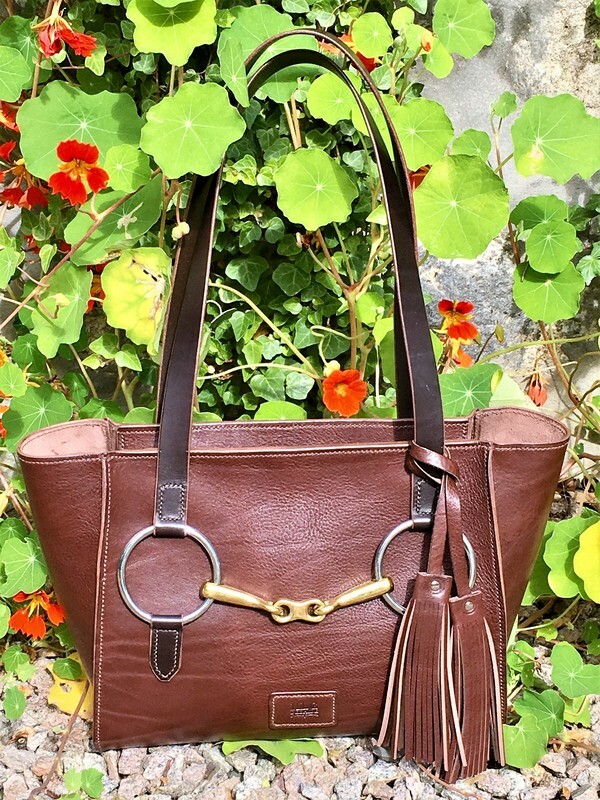 As I am usually working on a bag, you can then watch as I use these saddlery skills in real time. 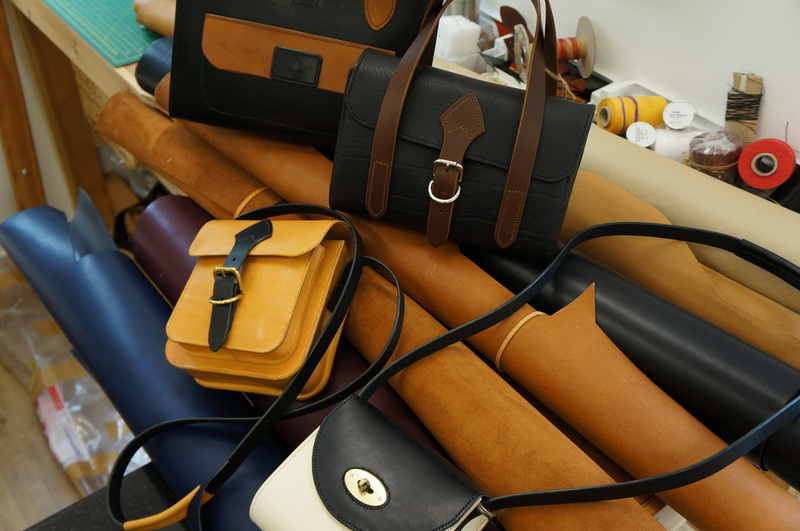 Finally, you can come across to the house and see the assortment of bags already made…and I might manage to pop out and put the kettle on! I look forward to seeing you during September! 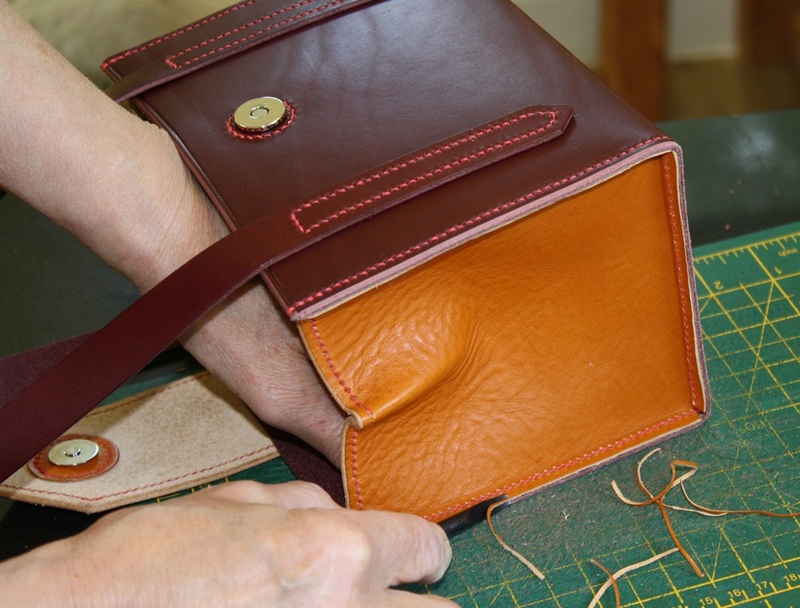 KLG Deehide is a small leather working business that was launched by me, Kathy Greaves, in 2012. 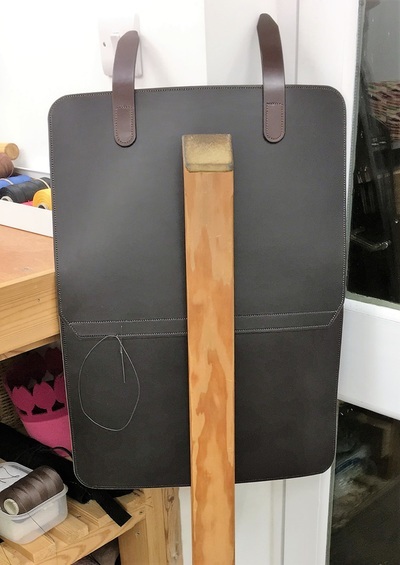 My workshop is based in a converted outbuilding of our home, a Victorian fishing lodge near Banchory on Royal Deeside, Scotland. 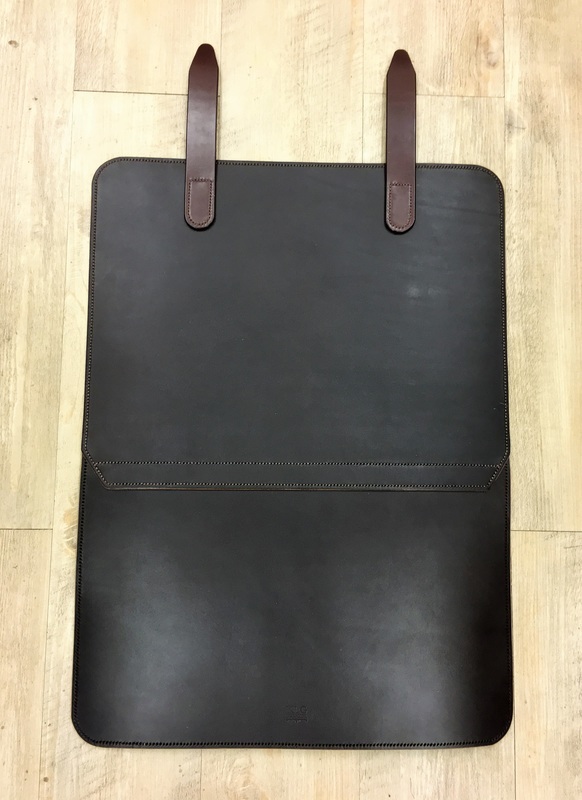 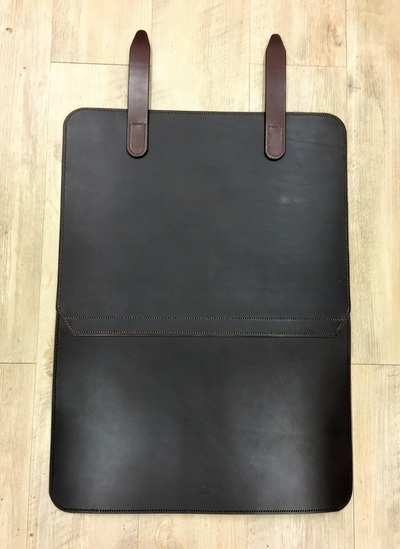 I design and make fine, hand-stitched contemporary leather bags, day sporrans and small personal leather items using European vegetable-tanned leather hide. 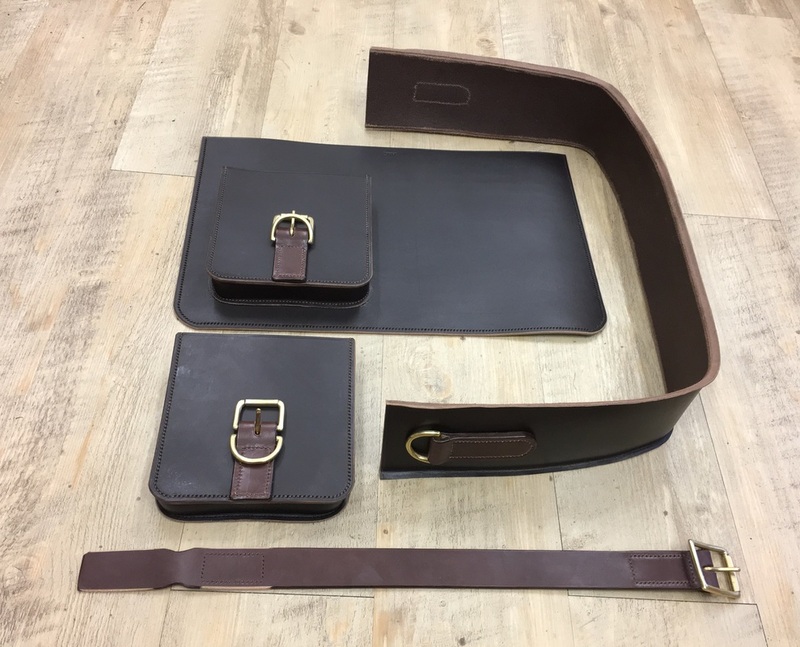 Each item is crafted using traditional saddlery skills over many hours, having been cut, saddle stitched and polished entirely by hand. 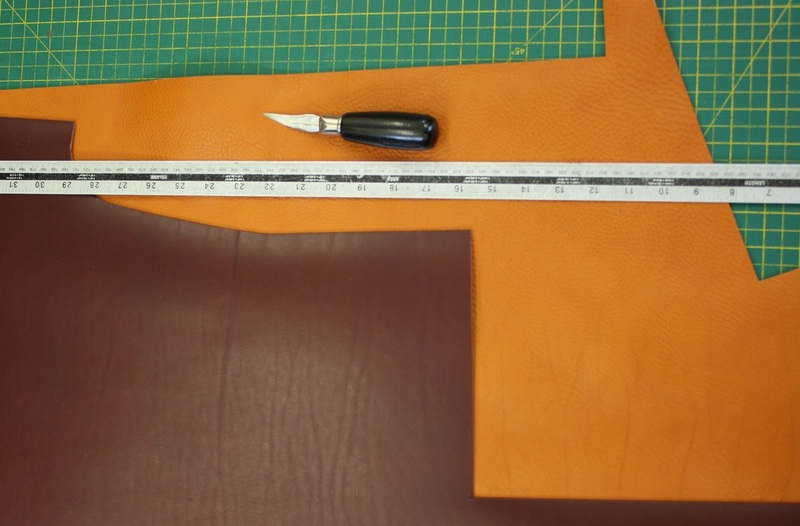 Attention to detail is important and with each piece, I concentrate on a high finish. 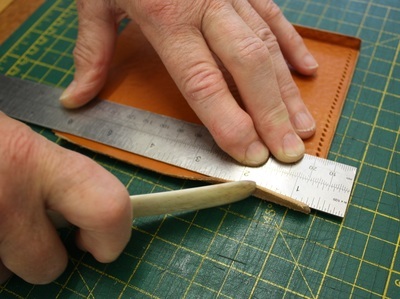 I spend 10 hours a day in my workshop preparing stock for sale online, at craft fairs and local galleries and normally break off for a morning jog around our woodland pathways when I can check out the local wildlife.